CategorySearch creates a category based data search UI component with an autosuggest functionality. It is used for applying full-text search across one or more fields. Searching for a rental listing by its name or description field. Creating an e-commerce search box for finding products by their listing properties. placeholder="Search for cities or venues"
data field(s) on which the search query will be applied to. If you want to search across multiple fields, pass them as an Array. data field which has the category values mapped. Sets the title of the component to be shown in the UI. 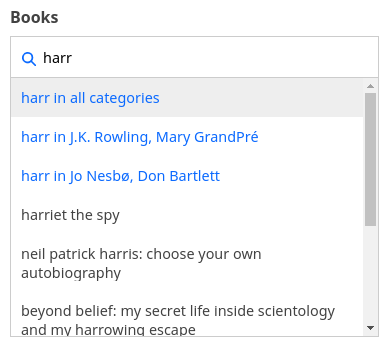 preset the search query text in the search box. allow passing props directly to Downshift component. You can read more about Downshift props here. set the search weight for the database fields, useful when dataField is an Array of more than one field. This prop accepts an array of numbers. A higher number implies a higher relevance weight for the corresponding field in the search results. Sets the placeholder text to be shown in the searhbox input field. Defaults to “Search”. set whether the autosuggest functionality should be enabled or disabled. Defaults to true. defaults to false. When set to true the component will only set its value and fire the query if the value was selected from the suggestion. Otherwise the value will be cleared on selection. This is only relevant with autosuggest. defaultSuggestions Array [optional] preset search suggestions to be shown on focus when the search box does not have any search query text set. Accepts an array of objects each having a label and value property. The label can contain either String or an HTML element. sets the milliseconds to wait before executing the query. Defaults to 0, i.e. no debounce. Whether highlighting should be enabled in the returned results. Defaults to false. When highlighting is enabled, this prop allows specifying the fields which should be returned with the matching highlights. When not specified, it defaults to applying highlights on the field(s) specified in the dataField prop. queryFormat String [optional] Sets the query format, can be or or and. Defaults to or. or returns all the results matching any of the search query text’s parameters. For example, searching for “bat man” with or will return all the results matching either “bat” or “man”. On the other hand with and, only results matching both “bat” and “man” will be returned. It returns the results matching all of the search query text’s parameters. fuzziness String or Number [optional] Sets a maximum edit distance on the search parameters, can be 0, 1, 2 or “AUTO”. Useful for showing the correct results for an incorrect search parameter by taking the fuzziness into account. For example, with a substitution of one character, fox can become box. Read more about it in the elastic search docs. enable creating a URL query string parameter based on the current value of the search. This is useful for sharing URLs with the component state. Defaults to false. it’s also possible to take control of the entire suggestions rendering using the renderSuggestions prop. Check the custom suggestions recipe for more info. // specify how and which suggestions are filtered using `react` prop. style Object CSS styles to be applied to the CategorySearch component. customQuery Function takes value and props as parameters and returns the data query to be applied to the component, as defined in Elasticsearch Query DSL. Note: customQuery is called on value changes in the CategorySearch component as long as the component is a part of react dependency of at least one other component. is a callback function which accepts component’s current value as a parameter. It is called everytime the component’s value changes. This prop is handy in cases where you want to generate a side-effect on value selection. For example: You want to show a pop-up modal with the valid discount coupon code when a user searches for a product in a CategorySearch. specify dependent components to reactively update CategorySearch’s suggestions.